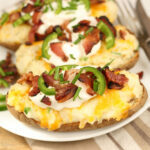 Loaded Twice Baked Potatoes are easy to make and use only a few simple ingredients. Top with shredded cheese, sour cream, bacon, chives, and slices of jalapeno peppers. Preheat your oven to 450 degrees F. Wash the potatoes and place them directly on the oven rack or on a half sheet pan lined with parchment paper. Cook the potatoes in the oven for about 1 hour or until tender. Cut the potatoes in half. Place the halves on a half sheet pan lined with parchment paper. Use a spoon to gently scoop the cooked potato into a bowl. Leave enough potato in the skins so they can stand on their own. Add the butter, heavy cream, and sour cream to the potatoes. Season with salt and black pepper to taste. Use a an electric hand mixer to mash the potatoes and combine the ingredients. Add more heavy cream if needed. You'll want the mashed potatoes to be fairly moist. Sprinkle each potato with additional shredded cheese and bake in a preheated 400 degree F oven for 15 minutes, or until the cheese is melted and bubbly. Top with sour cream, chives, bacon, and jalapeno pieces. Enjoy immediately. You can make the twice baked potatoes ahead of time. After you stuff the potato skins with twice baked potatoes, place in a freezer safe container, cover with plastic wrap and freeze. Thaw partially or completely before baking.